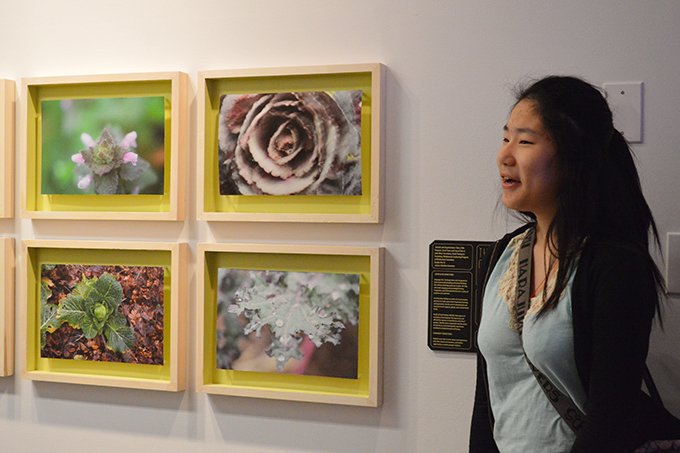 The ArtStarts Gallery opened its doors to our new View Finders exhibition on Saturday, April 16 as part of the Capture Photography Festival—showcasing the magic that occurs when young people across BC meet digital and analog photographic mediums. 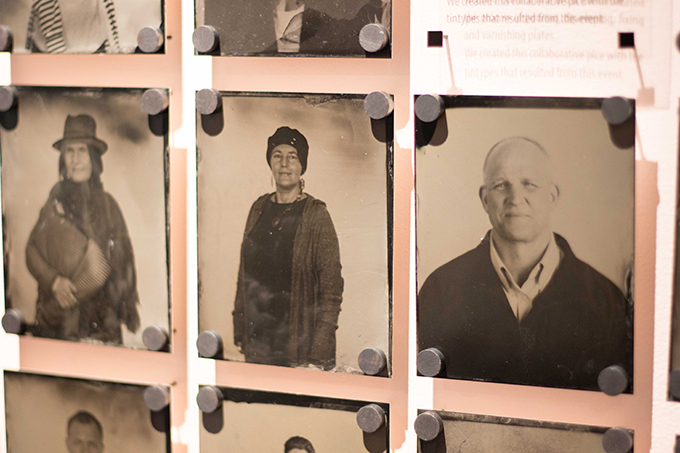 It was an afternoon where adults and kids enjoyed art, shared stories—and even created tintype images using a 100-year-old wooden camera to take a photo! ArtStarts volunteer Andrea Robin welcomed everyone to the gallery, and Gallery Manager Juliana Bedoya introduced the exhibition and explained the curatorial and installation process. 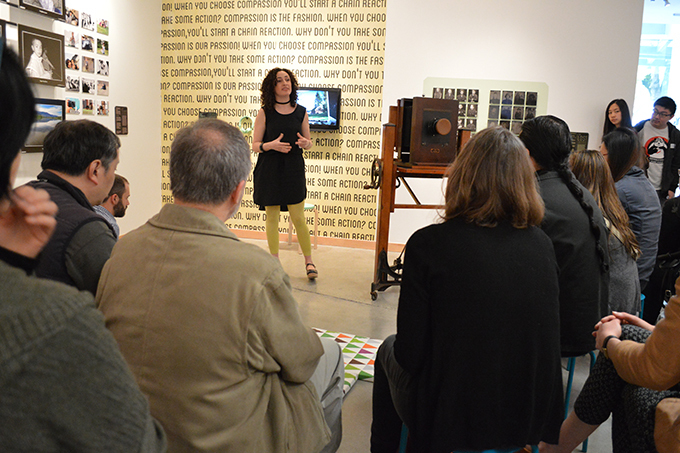 She emphasized that this is the first exhibit organized by medium (photography) instead of by theme, and the first time that the ArtStarts Gallery had partnered with a major festival. 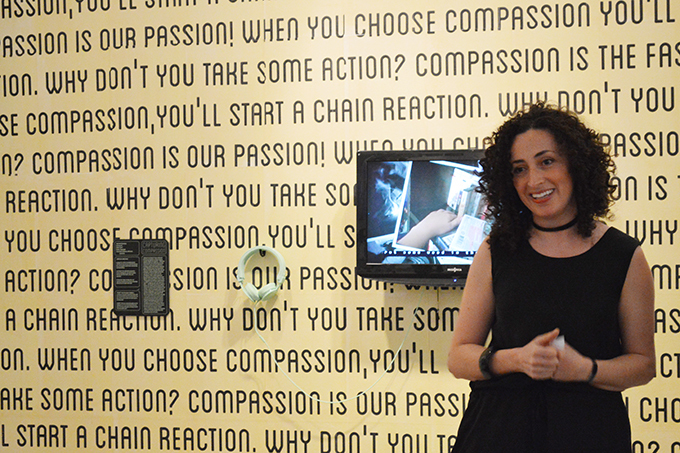 Juliana gave a very detailed explanation of the hands-on activities displayed on the gallery's central pillar. Each of the activities—the Compassion Station, the Direct Animation Station, the Food and Gardening Experience and the Tillikum Lens Approach—was inspired by artwork on display. We were thrilled to have students and representatives from many of the schools who created the artwork were in attendance. They shared stories about their experiences working on each project. It was inspirational to hear how much impact participation in these projects has on students. One of the girls who spoke said that photography and gardening became her passions after being part of the Through Our Eyes: Food and Gardening Experiences project. Teacher Scott Walters and photographer Phillip Chin gave an overview of The Lost Continent project, which inspired the day's upcoming hands-on workshop. 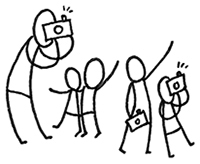 Scott talked about the whole process, from ideation to photography, as well as the students' reactions to the project. Phil introduced the audience to his wonderful 100-year-old camera, which everyone was looking forward to trying out for themselves. We took break to recharge with some delicious pizza. Guests explored the gallery, enjoyed the activities and artwork. Then it was onto the workshop portion of the day! 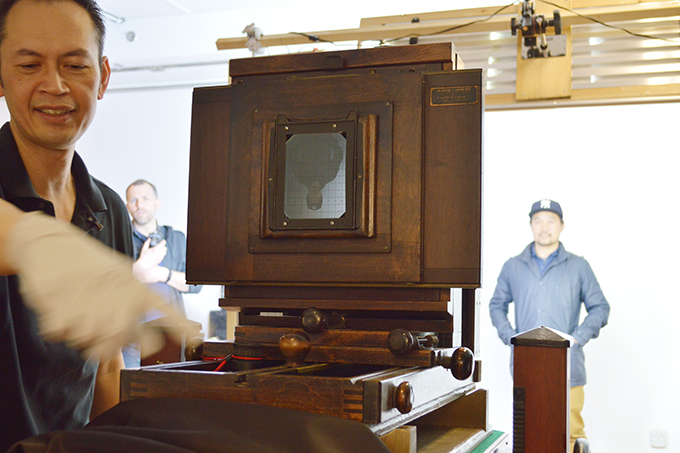 Photographer Phillip Chin and his assistant Maisie Lam facilitated the workshop in wet plate collodion or tintype photography. 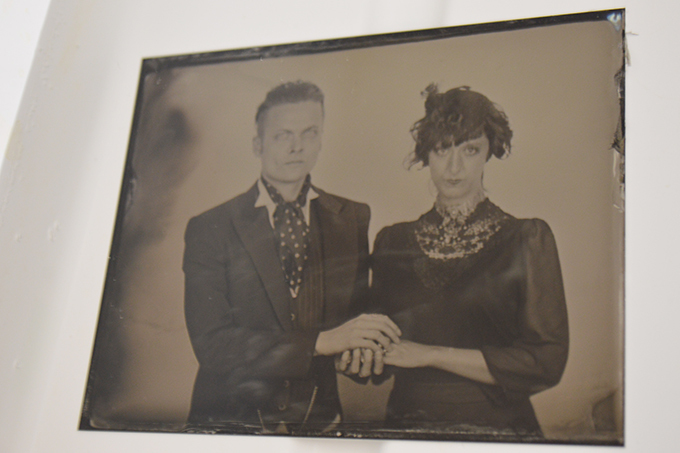 He explained the steps involved in producing a wet plate collodion photograph, including pouring, developing, fixing and varnishing the plates. Phil's set-up was incredible. 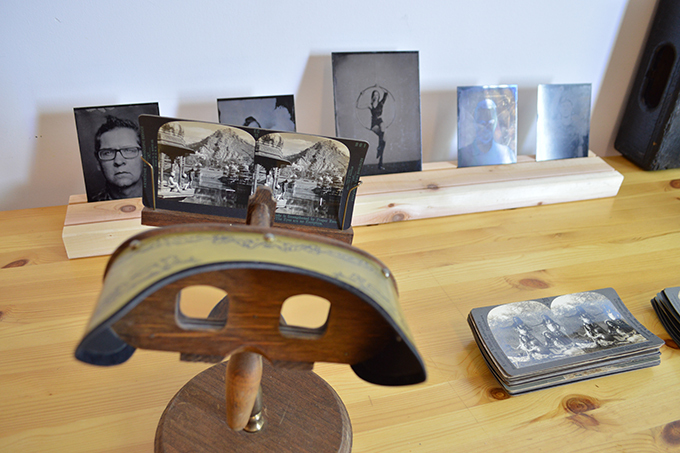 He had a portable dark room on site where participants could learn about the chemistry involved in this process, as well as a display of vintage photographic objects like lenses and stereoscopic toys. Eager participants lined up to have their photographs taken. Some people had dressed up for the occasion, including a very stylish steampunk couple. 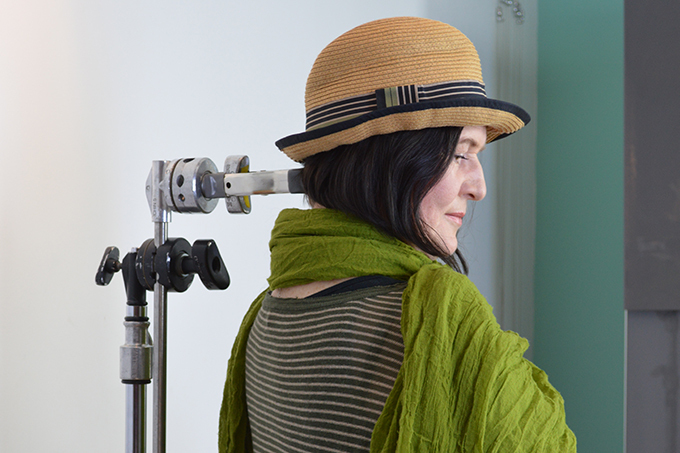 Subjects had to hold their body still for several minutes, so Phil set up people with metal stands that helped them to hold their head still. He then engaged the next person in line and walked them through the steps of taking a photograph. They had to focus the lens on the person's eye using a magnifying glass, cover the shutter and insert the plate. Then, they removed the lens cap for 16-22 seconds before quickly replacing the lens cap, exposing the film plate. Everyone got to watch the various stages of development. 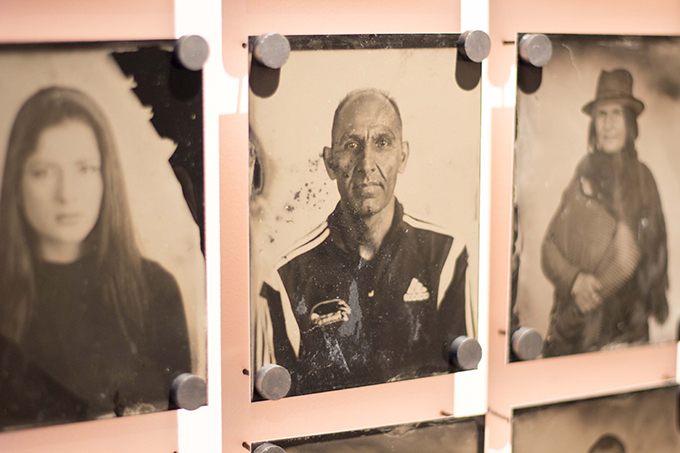 It was a great learning experience, as each person went through the entire process of capturing and developing a wet plate collodion photograph. Some amazing portraits of the community were created. Thanks to everyone who joined us for this celebration and workshop! 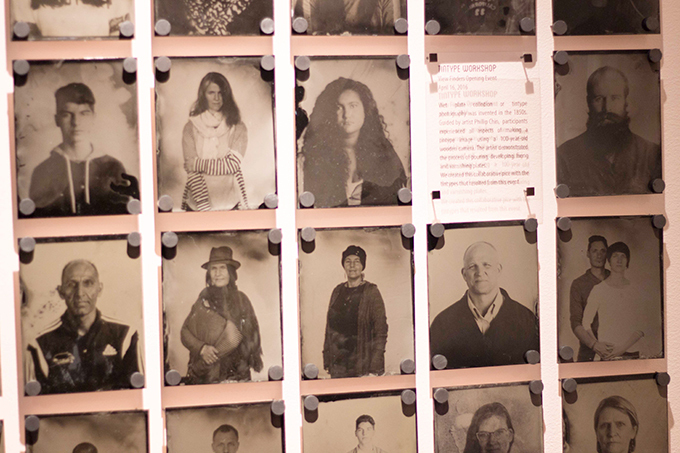 Visit the ArtStarts Gallery to see the View Finders exhibition—including the wet plate collodion photographs taken at the workshop. The ArtStarts Gallery, located at 808 Richards Street (at Robson) in Vancouver. The gallery is open Wednesday to Sunday, 10am to 4:30pm. Admission is free and all ages are welcome. Check out lots more photos in our Facebook album! View Finders: Young People's Art through a Lens-based Approach is View Finders is presented as part of the Capture Photography Festival. Thanks to Boeing for supporting the ArtStarts Gallery and thanks to our exhibition print sponsor, London Drugs Photolab.